WE MAKE GETTING DENTAL CARE EASY & AFFORDABLE! In order to receive a Premier Plan membership, you must pay for the plan	in full. 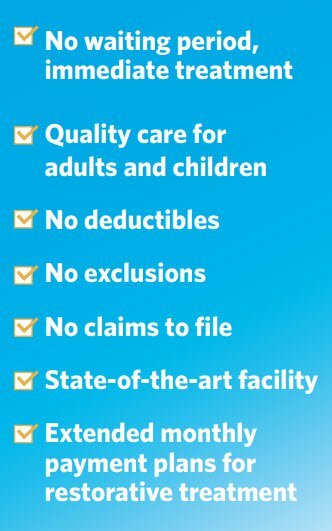 Monthly payment plan is available through Care Credit (or similar),	OAC. Enrollment minimum of 12 consecutive months is required. If you change your mind during the first 30 days, you may cancel your membership	and pay our regular fees for all services provided since joining the program. However, after 30 days our memberships are non-refundable. The Emerald City Smiles Premier Dental Plan covers Puget Sound area adults	as well as children up to and including age 17. All adults 18 and older	who are in the same family must sign our membership agreement. What is the Emerald City Smiles Premier Dental Plan? Our in-house dental plan is a discount that saves patients over 30% off	average dental treatment fees in the area. Who is the Emerald City Smiles Premier Dental Plan for? The plan is for individuals and families that don’t have insurance	and want to save money on dental care. Speak with our staff to enroll immediately! The consequence of multiple missed appointments will be a written warning. If you receive two written warnings, you could be dismissed from our practice	without a membership fee refund. Emergencies and illnesses are an exception, but patients need to call as	soon as they know they need to change a scheduled appointment. Emerald City Smiles will do our best to give you notice as well if we are	running significantly late on the day of your appointment. You will be	given the option to reschedule if necessary. Here are the fine print details. This plan is good for 12 months from the	date the membership is purchased and expires on the purchase date the	following year. This plan is not an insurance product and cannot be combined	with other dental benefit plans. Emerald City Smiles Premier Dental Plan	is for patients who do not have any alternative dental benefits. Emerald City Smiles reserves the right to revoke membership at any time	for abusive or inappropriate conduct towards doctors, staff or other patients. Those in violation of this membership rule will be dismissed with a single	written notice and will not be refunded. All new patients will receive a preliminary assessment. If, after this	exam, we do not feel confident in our ability to offer preventative care	or substantial portions of your treatment, your membership fee will be	refunded. You will be charged $99 for the new patient exam and up to $120	for any x-rays taken. If you choose a new provider, we’ll be happy	to send them digital copies of your x-rays. Dental Implants: Patients receiving treatments with dental implants at	our practice already enjoy a substantial fee reduction. Call our office if you have any questions about our membership plan.